Android has always amazed us with level of freedom it provides to its developers. It is due to this openness that developers are dedicated to invent more easy way to customize one’s devices. These new one click apps, automated software’s help non-tech to exploit their devices. We all know how to lock/unlock boot-loader of Nexus devices with Fastboot and wiping data finally. Wiping data is the thing which prevents people from unlocking boot-loader as they feel that to take backups and restore takes a lot of time and moreover they don’t get why they are doing that. But now thanks to a developer at XDA you can unlock and re-lock boot-loader of your Nexus devices in just a single click and that too without wiping data and Fastboot. Isn’t that amazing? If you want to know, just follow the simple guide below. 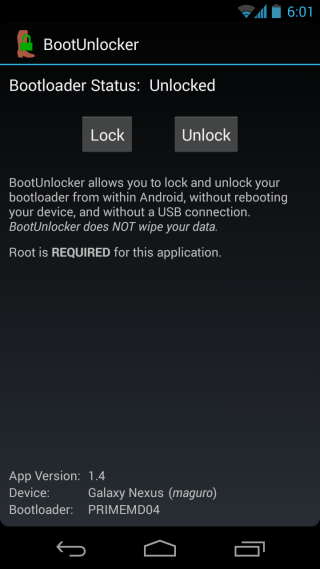 What can happen if bootloader of your device is unlocked? Whenever you flash a custom recovery by Fastboot method, Fastboot wipes all your data as at that time boot-loader your device is unlocked, and during this time there is high possibility of some virus or malicious files to enter your device and harm it. If your devices boot-loader remains unlocked and USB debugging is checked and you happen to install some application then it may even control your device and access it remotely without you knowing that which is really dangerous so we recommend to lock boot-loader after flashing custom recovery but locking boot-loader is another tedious task so to save your time we have an easy guide your you. Right now this application works with nexus devices only which include Galaxy Nexus, Nexus 4, Nexus 5, Nexus 7 and Nexus 10. Another requirement to use this application is you need to have your Nexus device rooted. After downloading the application simply open it and click on lock option in case you have an unlocked boot-loader otherwise on unlock if you happen to have locked boot-loader. This process neither reboots your device nor does it need you to connect it via USB cable. In case you are stuck at any step or you don’t understand what’s happening here make sure to type your query in the comments section below. We will be most happy to help you out.